Welcome to the “10th World Congress on Mass Spectrometry & Analytical Techniques”, the annual meeting devoted to diverse topics in the rapidly expanding field of Spectroscopy and Analytical Chemistry. 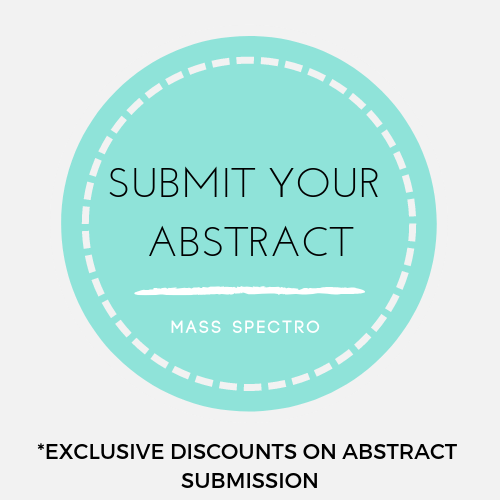 Mass Spectro 2019 is being organized underlining the theme “Insights into the modern world of Mass Spectrometry & Analytical Chemistry”. 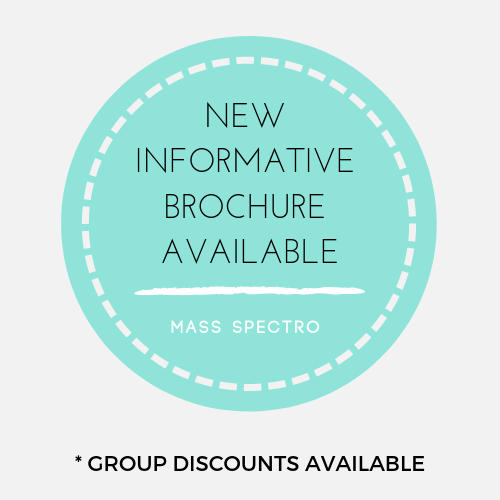 The main aim of the Mass Spectro 2019 is to promote innovation, share and advance knowledge, and to encourage applications of Spectroscopy in chemistry, as well as in physical and biological sciences and their applications. These aims are achieved with the aid of an annual international meeting, often followed by the publication of proceedings in peer-reviewed international journals. All submitted conference papers will be peer-reviewed by competent reviewers. The post-conference proceedings will be abstracted and indexed in the International Journals. Join us and take part in carving out a brighter tomorrow aiding the promising developments through sharing your valuable experiences at this esteemed “10th World Congress on Mass Spectrometry & Analytical Techniques" going to be held on October 24-25, 2019 at Prague, Czech Republic. It is a powerful analytical technique which is used to quantify the known materials, to identify unknown compounds within a sample, and also to elucidate the chemical and structural properties of different molecules. This process involves the conversion of sample into gaseous ions, without or with fragmentation and then characterize is done by the mass to charge ratios (m/z) and relative abundances. The quantification, separation, and identification of chemical compounds are done by Analytical Chemistry. The chemical analyses can be quantitative or qualitative, quantitative as in determining the amount of a certain component in the sample and qualitative as in the identification of the chemical components. Raman spectroscopy is one of the most famous Spectroscopy methods in this field, it is a spectroscopic technique used to observe rotational, vibrational, and other low-frequency modes in a system. A structural fingerprint by which molecules can be identified is done by this technique. It is chiefly concerned with the analysis of objects in space. From a simple spectroscopic analysis of a body, we can determine their wavelength, which can then give us their chemical composition (as a factor of their spectra and mass), temperature, distance and speed (using a function of their wavelength and the speed of light). The study of infrared light interacting with a molecule is Infrared Spectroscopy. This can be analyzed by measuring absorption, emission, and reflection. The technique is applied in organic and inorganic chemistry. The functional groups are determined in molecules and measures the vibrations of atoms and based on this, it is possible to define the functional groups of these elements. The technique uses basically the principle that free atoms (gas) generated in an atomizer can absorb radiation at the precise frequency. Atomic-absorption spectroscopy calculates the absorption of ground state atoms in the gaseous state. Ultraviolet and visible (UV-Vis) absorption spectroscopy is the measurement of the attenuation of a beam of light after it passes through a sample or after reflection from a sample surface. Absorption measurements can be at a single wavelength or over an extended spectral range. There are different ways in which X-rays can be employed. Absorption of X-rays is about absorbing the material in other regions of the spectrum. Fluorescence emission of X-rays enables to identify and measure heavy elements in any medium. Diffraction of X-rays enables to analyze the specificity and accuracy of crystalline materials with a high degree. Energy Dispersive X-Ray spectroscopy (otherwise known as EDS/EDX) is another analytical technique which is used for the identification and quantification of elements found in a sample. This technique scan also is used in conjunction with Transmission Electron Microscopy (TEM), Scanning Electron Microscopy (SEM) and Scanning Transmission Electron Microscopy (STEM) to create spatially resolved elemental analysis in areas as small as a few nanometres in diameter. The study of dynamic processes in materials or chemical compounds by means of spectroscopic techniques is Time-Resolved (TR) Spectroscopy. Most often, processes are studied after the illumination of material occurs, but in principle, the technique can be applied to any process that leads to a change in the properties of a material. Recent successes exemplify the role of mass spectrometry-based proteomics as a crucial tool for molecular and cellular biology and for the emerging field of systems biology. These include the study of protein-protein interactions via affinity-based isolations on a small and proteome-wide scale, the mapping of numerous organelles, the synchronized description of the malaria parasite genome and proteome, and the generation of quantifiable protein profiles from diverse species. The ability of mass spectrometry to identify and, increasingly, to exactly quantify thousands of proteins from complex samples can be expected to impact broadly on biology and medicine. Electron paramagnetic resonance (EPR) or electron spin resonance (ESR) spectroscopy is a method for studying materials with unpaired electrons. The basic concepts of EPR are equivalent to those of nuclear magnetic resonance (NMR), but it is electron rotations that are excited instead of the spins of atomic nuclei. Terahertz spectroscopy is a rapidly evolving field with interesting applications in medical imaging, security, scientific imaging (chemistry, biochemistry, and astronomy), communications, and manufacturing. The generation and detection scheme is sensitive to the sample's effect on both the amplitude and the phase of the terahertz radiation. Chromatography, the method of separating the components, or solutes, of a mixture on the basis of the relative amounts of each solute distributed between moving fluid streams, called the mobile phase, and a contiguous stationary phase. The mobile phase may be any of liquid or a gas, while the stationary phase is any a solid or a liquid. It is a technique in analytical chemistry used to separate, identify, and quantify each component in a mixture. It relies on pumps to pass a pressurized liquid solvent containing the sample mixture through a column filled with a solid adsorbent material. It is one of the spectroscopic techniques that measure the absorption of radiation, as a function of frequency or wavelength, for its interaction. The sample absorbs energy, i.e., photons, from the radiating field. The technique uses basically the principle that free atoms (gas) generated in an atomizer can absorb radiation at a specific frequency. Spectroscopic methods play an increasingly important role in studying the molecular specifics of complex biological systems in health and disease. It is a multidisciplinary research field involving spectroscopic tools for applications in the field of biomedical science. The most intriguing part for researchers is the complex properties which are shown by nanoparticles and nanostructures. Microscopic methods such as SPM and electron microscopes are available to observe nanomaterials at the nanoscale level but the chemical, structural and optical properties are not possible with these instruments. This is where spectroscopic characterization techniques are used to investigate the properties of the nanomaterials. The individual substances in a mixture can be separated using different methods, depending on the type of mixture. These methods include filtration, evaporation, distillation, and chromatography. Identify an appropriate separation technique to separate a mixture based on the physical properties of the components of the mixture. Computed tomography (CT) is an imaging procedure that uses special x-ray equipment to create detailed pictures, or scans, of areas inside the body. It is also called computerized tomography and computerized axial tomography (CAT). CT scan images provide more-detailed evidence than plain X-rays do. Crystallography is the science that examines crystals, which can be found everywhere in nature from salt to snowflakes to gemstones. Crystallographers use the properties and inner structures of crystals to determine the arrangement of atoms and generate knowledge that is used by chemists, physicists, biologists, and others. They study it by X-rays and electrons, their application in condensed matter research, materials science and the life sciences. Clinical Chemistry is that field of clinical pathology involved with analysis of body fluids. The origin was in the late nineteenth century with the use of simple chemical tests for diverse elements of blood and waste product. After this, totally different clinical biochemistry techniques were applied to the side of the use and live of catalyst activities, spectrophotometry, action, and biological assay. The importance of matching international standards of quality across industries such as pharmaceutical as well as food and agriculture industries which includes rising adoption of the process technology is promoting the growth of spectroscopy market. The growth forecast is expected to grow at a CAGR of 8.4% during the period from 2017 to 2025. 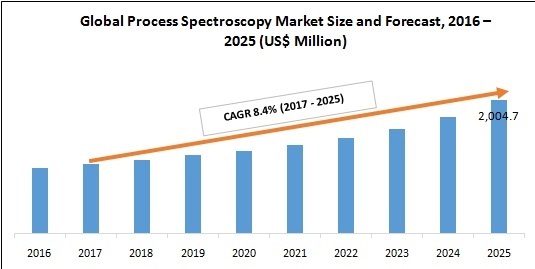 The world process spectroscopy market is anticipated to reach USD 2005.2 million in 2025. Due to the presence of several global and regional vendors, the spectroscopy market appears to be fragmented. The competition among the companies is mainly focussed on factors such as production volume, quality, innovation in technology, and aftersales services. The major challenges to spectroscopy manufacturers are consumer preferences, rapid improvements in technology and, intense competition among them. Companies are concentrating on developing products with innovative technologies and are highly focussing on improving revenue. • Other prominent vendors include FOSS, GBC Scientific Equipment, JASCO, Metal Power, Rigaku Corporation, and WATERS. 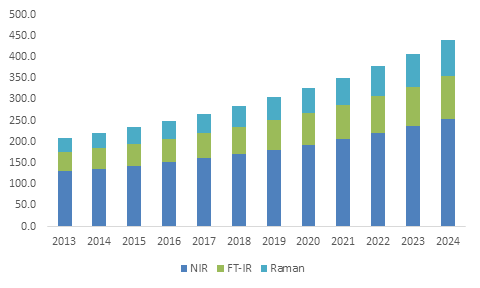 Recent and several technological developments in Raman Spectroscopy such as estimation of purity of a compound and the detailed fingerprinting are derivable from Raman Spectrum. Furthermore, by the introduction of cloud-based spectroscopy, various opportunities will arise in terms of adoption of diverse end-use industries. Cloud-based Spectroscopy can dynamically scale up and down the resources to be computed to match a varying workload. Similarly, implementation of Process Analytical Technology (PAT) is to ensure the high-quality performance of the final product that provides more benefits. Though, the high initial capital investment needed for employing spectroscopic equipment and complications involved in the use of these devices will create a challenge for the complete growth of this market. Over 60% of the overall process spectroscopy market share is NIR technology segment. It is likely to grow 6% CAGR from 2016 to 2024. Growth in this particular sector can be attributed to rising application in the number of sectors from the food industry, quality monitoring, biogas plants, plastics identification in the chemical industry and controlling paper production. Fourier Transform Infrared (FT-IR) was valued at over USD 170 million in 2015 and is projected to account for over 20% of the overall industry share by 2024. Rising in the use of this technology in identification as well as the assessment of numerous materials, chemicals & compounds such as particulates, chemical warfare agents, residues, fibers, pesticides, and narcotics may propel industry demand over the next few years. The U.S. process spectroscopy market size is expected to increase in pharmaceuticals, healthcare, agriculture and food sector due to the presence of key industry participants and stringent quality standards. Asia Pacific overall revenue will grow at 8% CAGR from 2016 – 2024. Presence of resources and cheap labor, manufacturing activities of industry participants are increasing by relocating research and development. This will impact towards contributions of regional growth. Rising awareness regarding quality products and standards among people is likely to force players to adhere to guidelines of international quality standards. Through certification and to improve brand image companies started implementing the quality measure. These measures are expected to offer benefits such as an improvement in product quality, process effectiveness and cost saving. Now, the companies are and top key players are focusing on the development of instruments and solutions which can implement FT-IR and NIR into a single device. Bruker Corporation already developed MPA (Multipurpose FT-NIR analyzer. Companies such as Thermo Fisher Scientific which is considered as one of the key players in the market is offerings include reagents, equipment with consumables, analytical instruments, and software and services for research & analysis, manufacturing, diagnostics, and discovery. The company has four operating business segments, laboratory products, and specialty diagnostics and services, life technologies business and analytical technologies. Companies such as 3M, Boeing, General Electric (GE), Hewlett Packard (HP) and Lockheed Martin have successfully implemented Six Sigma. Governments worldwide are anticipated to lay down strict quality policies for manufacturing in order to get enhanced products.